Museum of Natural History Visit the museum to learn about the Keys environment and history including: Spanish explorers, Tree Snails, Adderley Village, Coral Reef cave Meet a Moray Eel and more! Nature Trails Wind you way through a dense hardwood hammock and be rewarded by a spectacular view of Florida Bay and the 1950's Crane House, which is currently being restored. Marathon Wild Bird Center The Bird Center offers a wonderful opportunity to see wild birds up close. Learn how injured birds are brought to be rehabilitated and maybe even get the chance to witness a release! Creature Feature On the deck of the Cracker House do not miss the chance to observe native snakes, purple pincher crabs and an observational bee hive exhibit. Children's Activity Center Spend time enjoying the lagoons and exploring the invertebrates in the Marine Touch Tanks. Kids of all ages will enjoy playing on a replica pirate ship complete with costumes Adderley House Visit the oldest house in the Keys, outside of Key West. This house was built by Bahamian pioneers in 1903 out of tabby, a primitive form of concrete.Observe a 600 year-old dugout canoe, remnants of pirate ships and a simulated coral reef cave at the Museum of Natural History. Learn about the native Keys inhabitants, the early explorers, the pioneers and developers of the "Railroad that Died at Sea." See the Bellarmine jug (circa 1580), a shipwreck artifact that was found in 1980 in almost perfect condition in the Atlantic Ocean off the Florida Keys. Be introduced to Key deer and other animals native to the Keys including turtles, snails, snakes and whales through the museum's displays. 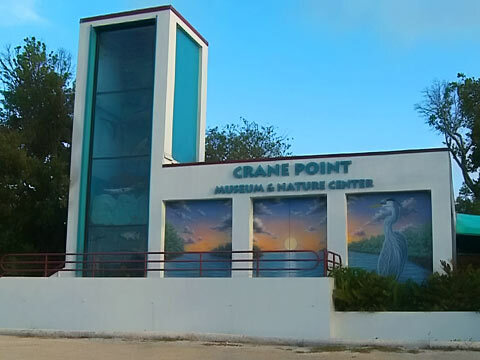 The seabird and water diorama will familiarize you to what you might see as you view Florida Bay at the waters edge of Crane Point. Children's Activities Center Relive the swashbuckling adventures of Keys Pirates in the Children's Activity Center, located on the deck outside Orientation Theatre. Climb aboard a 17th century galleon, "Los Ninos de Los Cayos," an interactive vessel complete with pirate clothes and treasure! All ages will enjoy examining crabs, starfish, sea urchins, sea cucumbers, conchs and other sea creatures in the touch tanks located on both sides of the deck.